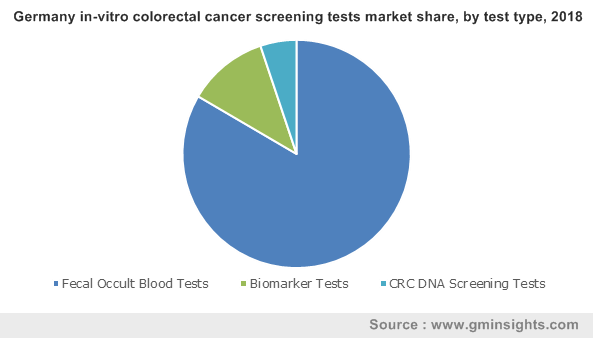 In-Vitro Colorectal Cancer Screening Tests Market size was valued over USD 0.9 billion in 2018 and is expected to witness 5.3% CAGR from 2019 to 2025. Rising incidence of cancer, growing demand for non-invasive disease diagnosis methods along with technological advancements in cancer screening techniques will drive in-vitro colorectal cancer screening tests market over the forecast timeframe. Favourable regulations and cost effectiveness of DNA sequencing will further propel industry growth. U.S. FDA recently approved faecal DNA test and blood test for colorectal cancer screening, thus fulfilling growing consumer demand for minimally invasive screening tests. According to the National Cancer Institute’s statistics, nearly 1,317,247 people in U.S. suffered from colorectal cancer in the year 2014. Moreover, prevalence of colorectal cancer among younger population will stimulate demand for colorectal screening tests during forecast period. Technological advancements including high speed DNA sequencing coupled with cost effectiveness of DNA sequencing will fuel in-vitro colorectal cancer screening tests market. Growing R&D towards developing advanced DNA sequencing methods such as RNAP sequencing, hybridization, microfluidic sanger sequencing and will positively impact market growth. However, scarcity of trained professionals in developing countries, inadequate reimbursement coverage and lack of uniform cancer screening guidelines in Asia Pacific will hinder market growth over the coming years. Faecal occult blood test dominated global in-vitro colorectal cancer screening tests market in 2018 by capturing 83.8% share and is estimated to follow similar trend over the forecast timeframe. Growing adoption of faecal occult blood test along with its cost effectiveness will drive market growth. Immuno-FOB Agglutination and Immuno-FOB ELISA tests are revenue generating business segments of faecal occult blood test. Lateral flow Immuno-FOB test market is anticipated to witness considerable growth of 5.8% over the coming years due to its enhanced specificity and sensitivity. It can be used in wide range of settings. Moreover, its low sample volume requirement and ease of use will fuel industry growth. Growing research activities pertaining to development of novel biomarker assays, growing awareness about early disease diagnosis allowing use of diagnostic biomarkers will fuel growth of biomarker test segment over the forecast timeframe. Enzyme biomarker M2-PK been considered as vital enzyme in colorectal cancer and polyps will drive tumor M2-PK stool test segment. 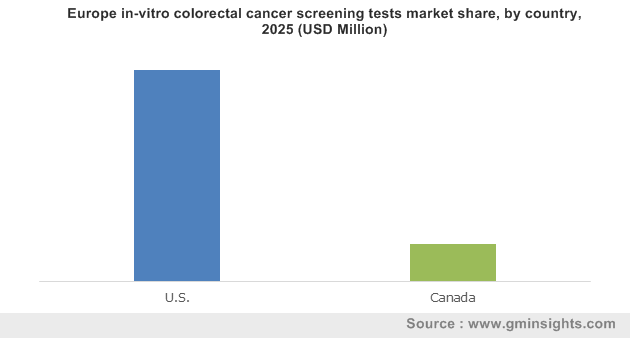 U.S. dominated North America in-vitro colorectal cancer screening tests market with revenue of USD 255.4 million in 2018 due to large patient population base, high adoption of sedentary lifestyle and unhealthy food habits. Increasing initiatives undertaken by private and public players to create awareness about disease and diagnostic methods will further drive U.S. in-vitro colorectal cancer screening tests market over the forecast period. High technological adoption, technological advancements in cancer screening techniques and rising incidence of bowel cancer will drive Germany in-vitro colorectal cancer screening tests market. 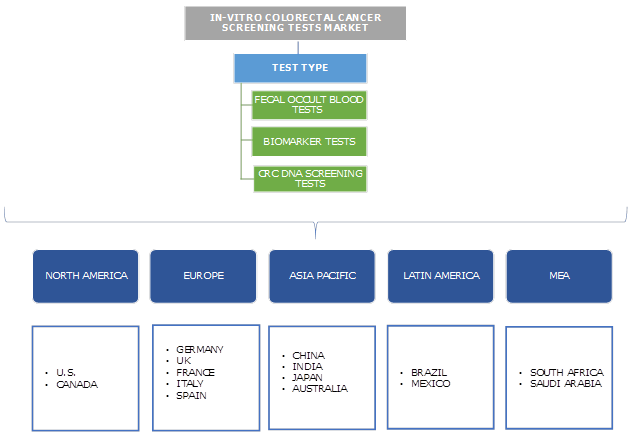 Growing application of screening tests for prevention of bowel cancer coupled with presence of German national statutory cancer screening programme will positively impact market size growth. Japan in-vitro colorectal cancer screening tests market will grow at 6.1% during the forecast period. The country is driven by high disease prevalence, rising demand for cancer screening tests and numerous efforts by government to reduce disease burden. Presence of Cancer Control Act of 2006, improvement in colorectal cancer screening will further propel industry growth. Growing prevalence of colorectal cancer coupled with several initiatives undertaken by government to reduce disease burden will drive Brazil in-vitro colorectal cancer screening tests market. Initiatives such as colorectal cancer (CRC) screening program and Brazilian Association of Intestinal Cancer Prevention (ABRAPRECI) program will positively impact market growth. Few notable players of global in-vitro colorectal cancer screening tests market are EMD Millipore, Siemens Healthcare, Qiagen, Alere and Beckman Coulter. Industry players are engaged in research and development activities to develop tests with superior specificity and sensitivity with relative low price to gain significant market share. New product development, strategic collaboration and expansion through setting up new manufacturing facilities are some of the strategies adopted by market players to consolidate their market position. Other active players in the market include Abbott Molecular, Epigenomics AG, Sysmex Corporation, Eiken Chemical Quest Diagnostics, OncoCyte Corporation-Bio time, BioMarCare Technologies, Novigenix, Randox Laboratories, Exact Sciences Corporation, Immunostics, GeneNews, Kyowa Medex, and R-Biopharm Incorporation. 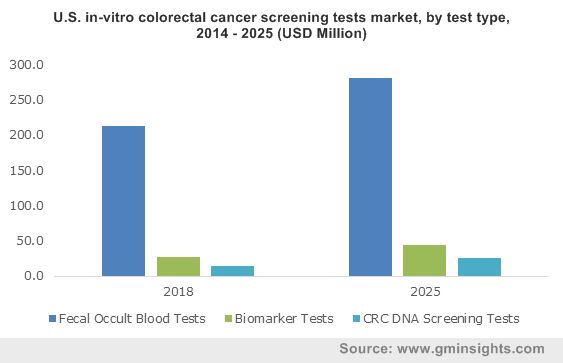 Growing incidence of colorectal cancer globally along with rising disease awareness due to numerous initiatives undertaken by public and private players will drive in-vitro colorectal cancer screening tests market. Industry players are focusing on developing low cost cancer screening tests with enhanced sensitivity and specificity to gain significant market share along with sustaining their market position. Technological advancements in field of genomics, next generation DNA sequencing and growing demand for minimal invasive techniques for disease screening will positively impact market growth. Market players such as Alere are adopting various expansion strategies to gain significant market share in emerging markets. For instance, Alere established new manufacturing facility in India in April 2016.